EnviroShield disaster restoration coatings include: Oil Base 7000 Stain & Odor Sealer, Shellac 9000 Stain & Odor Blocker, and Masonry 3000 Waterproof Latex Coating. 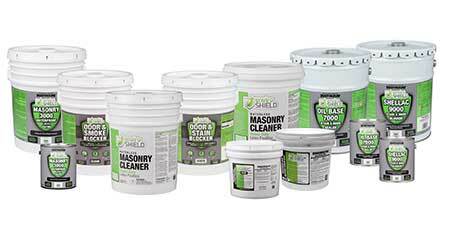 EnviroSHIELD Oil Base 7000 is formulated for whole surface interior priming. The high-solids formula combines outstanding adhesion, reliable stain blocking and effective odor sealing performance characteristics. One coat will block stains from water, soot, smoke, nicotine, rust and mildew. EnviroShield Oil Base 7000 seals odors from fire damage, smoke, mildew, pet urine, and fireplace and furnace puff backs. EnviroSHIELD Shellac 9000 is an odor and stain blocker. It permanently blocks severe stains and creates an odor barrier making it ideal for fire and water damage, trauma scenes, graffiti, and fire and furnace smoke damage. Can be applied at temperatures from zero to 90 F.
EnviroSHIELD Masonry 3000 Waterproof Coating forms an impermeable barrier to water on interior or exterior, vertical or horizontal concrete block and cast-in-place concrete. Backed by a 15-year waterproof and 10-year mold and mildew resistant finish guarantee, it blocks up to 20 PSI of water pressure. Meets ASTM D-7088 Resistance to Hydrostatic Pressure, ASTM D-6904 Resistance to Wind Driven Rain and ASTM D-5590 Fungal Defacement Test.